For the first time, a Mumbai-style attack has occurred on Western soil — the worst attack on Europe in decades. As such, it has triggered a seemingly commensurate response from France: the declaration of a nationwide state of emergency, the likes of which have not been seen since the 1961 Algerian war. France’s defiant promise, according to Hollande, is to “destroy” ISIS. The ripple effect from the attacks in terms of the impact on Western societies is likely to be permanent. In much the same way that 9/11 saw the birth of a new era of perpetual war in the Muslim world, the 13/11 Paris attacks are already giving rise to a brave new phase in that perpetual war: a new age of Constant Vigilance, in which citizens are vital accessories to the police state, enacted in the name of defending a democracy eroded by the very act of defending it through Constant Vigilance. “France is at war,” Hollande told French parliament at the Palace of Versailles. Further corroboration came from a Sky News Arabia report by correspondent Stuart Ramsey, which revealed that the Turkish government was certifying passports of foreign militants crossing the Turkey-Syria border to join ISIS. The passports, obtained from Kurdish fighters, had the official exit stamp of Turkish border control, indicating the ISIS militants had entered Syria with full knowledge of Turkish authorities. A report by the Turkish Statistics Institute confirmed that the government had provided at least $1 million in arms to Syrian rebels within that period, contradicting official denials. Weapons included grenades, heavy artillery, anti-aircraft guns, firearms, ammunition, hunting rifles and other weapons — but the Institute declined to identify the specific groups receiving the shipments. Senior officials of the ruling AKP have conceded the extent of the government’s support for ISIS. The paper also reported that ISIS militants routinely receive medical treatment in hospitals in southeast Turkey— including al-Baghdadi’s right-hand man. 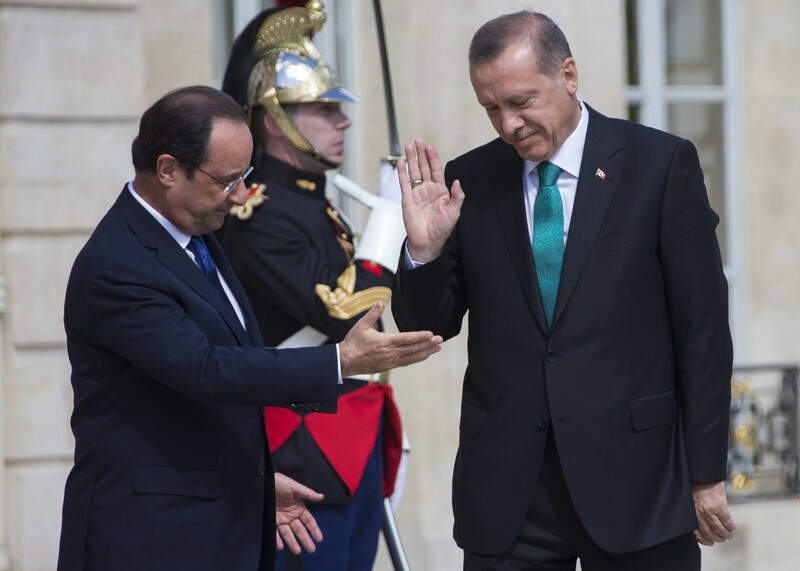 Unsurprisingly, then, Turkey’s anti-ISIS bombing raids have largely been token gestures. Under cover of fighting ISIS, Turkey has largely used the opportunity to bomb the Kurdish forces of the Democratic Union Party (YPG) in Syria and Kurdistan Workers Party (PKK) in Turkey and Iraq. Yet those forces are widely recognized to be the most effective fighting ISIS on the ground. Meanwhile, Turkey has gone to pains to thwart almost every US effort to counter ISIS. When this summer, 54 graduates of the Pentagon’s $500 million ‘moderate’ Syrian rebel train-and-equip program were kidnapped by Jabhat al-Nusra — al-Qaeda’s arm in Syria — it was due to a tip-off from Turkish intelligence. Nevermind that Turkey has facilitated about $1 billion in ISIS oil sales. No doubt this would be great news for the security of Europe’s borders. It is not just Turkey. Senior political and intelligence sources in the Kurdish Regional Government (KRG) have confirmed the complicity of high-level KRG officials in facilitating ISIS oil sales, for personal profit, and to sustain the government’s flagging revenues. Despite a formal parliamentary inquiry corroborating the allegations, there have been no arrests, no charges, no prosecutions. The KRG “middle-men” and other government officials facilitating these sales continue their activities unimpeded. Declassified government documents clarify beyond all doubt that a primary motivation for the 2003 Iraq War, preparations for which had begun straight after 9/11, was installing a permanent US military presence in the Persian Gulf to secure access to the region’s oil and gas. The obsession over black gold did not end with Iraq, though — and is not exclusive to the West. “Most of the foreign belligerents in the war in Syria are gas-exporting countries with interests in one of the two competing pipeline projects that seek to cross Syrian territory to deliver either Qatari or Iranian gas to Europe,” wrote Professor Mitchell Orenstein of the Davis Center for Russian and Eurasian Studies at Harvard University, in Foreign Affairs, the journal of Washington DC’s Council on Foreign Relations. Then in July 2011, a $10 billion Iran-Iraq-Syria pipeline deal was announced, and a preliminary agreement duly signed by Assad. “The United States… supports the Qatari pipeline as a way to balance Iran and diversify Europe’s gas supplies away from Russia,” explained Orenstein in Foreign Affairs. The pipelines would access not just gas in the Iran-Qatari field, but also potentially newly discovered offshore gas resources in the Eastern Mediterranean — encompassing the offshore territories of Israel, Palestine, Cyprus, Turkey, Egypt, Syria, and Lebanon. The area has been estimated to hold as much as 1.7 billion barrels of oil and up to 122 trillion cubic feet of natural gas, which geologists believe could be just a third of the total quantities of undiscovered fossil fuels in the Levant. Assad’s brutality and illegitimacy is beyond question — but until he had demonstrated his unwillingness to break with Russia and Iran, especially over their proposed pipeline project, US policy toward Assad had been ambivalent. President Obama’s preference for the latter resulted in US officials, including John Kerry, shamelessly courting Assad in the hopes of prying him away from Iran, opening up the Syrian economy to US investors, and aligning the regime with US-Israeli regional designs. Even when the 2011 Arab Spring protests resulted in Assad’s security forces brutalizing peaceful civilian demonstrators, both Kerry and then Secretary of State Hillary Clinton insisted that he was a “reformer” — which he took as a green light to respond to further protests with massacres. Assad’s decision to side with Russia and Iran, and his endorsement of their favoured pipeline project, were key factors in the US decision to move against him. Turkey plays a key role in the US-Qatar-Saudi backed route designed to circumvent Russia and Iran, as an intended gas hub for exports to European markets. It is only one of many potential pipeline routes involving Turkey. “Turkey is key to gas supply diversification of the entire European Union. It would be a huge mistake to stall energy cooperation any further,” urged David Koranyi, director of the Atlantic Council’s Eurasian Energy Futures initiative and a former national security advisor to the Prime Minister of Hungary. Given Europe’s dependence on Russia for about a quarter of its gas, the imperative to minimize this dependence and reduce the EU’s vulnerability to supply outages has become an urgent strategic priority. The priority fits into longstanding efforts by the US to wean Central and Eastern Europe out of the orbit of Russian power. “Coal, oil and gas resources in Europe are running down and we need alternatives,” said GSI’s Professor Victoria Andersen. She also recommended a rapid shift to renewables, but most European leaders apparently have other ideas — namely, shifting to a network of pipelines that would transport oil and gas from the Middle East, Eastern Mediterranean and Central Asia to Europe: via our loving friend, Erdogan’s Turkey. But fear not: Hollande is still intent on “destroying” ISIS. Just like Obama and Cameron — and Erdogan. It’s just that some red lines simply cannot be crossed. He is the winner of a 2015 Project Censored Award, known as the ‘Alternative Pulitzer Prize’, for Outstanding Investigative Journalism for his Guardian work, and was twice selected in the Evening Standard’s ‘Power 1,000’ most globally influential Londoners, in 2014 and 2015. This article was amended on 21st November 2015 to review and supplement sources cited relating to Turkish sponsorship of ISIS, ensuring their credibility, accuracy and plausibility. Some previously quoted sources were removed due to being too partisan within the Turkish political scene, and new more reliable sources added. This exclusive is being released for free in the public interest, and was enabled by crowdfunding. I’d like to thank my amazing community of patrons for their support, which gave me the opportunity to work on this story. Please support independent, investigative journalism for the global commons via Patreon.com, where you can donate as much or as little as you like.